A shorter version of this paper, with a somewhat different focus, appeared in InPsych, the Bulletin of the Australian Psychological Society, in August 2017. Here, Dr Power draws insights from his observations of what makes some leaders successful, while others continue to flounder and struggle to perform in the role. 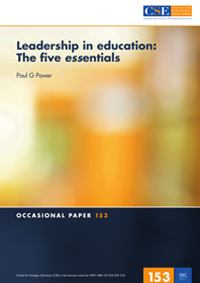 In a nutshell, he says, these insights boil down to five characteristics, which he discusses in the paper – self image; self control; socialised power; sustained dialogue; and strategic intent – what he calls the five essentials of leadership. When school leaders act according to these principles, he concludes, perceptions of the school by those within it and associated with it are more likely to be positive, leading to improved teacher performance and better student learning.